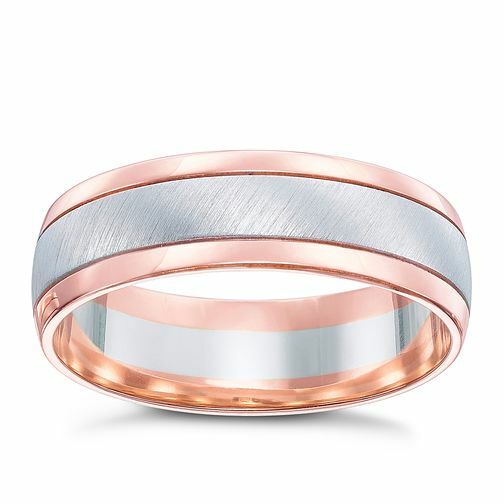 Get the best of both worlds with this 6mm wedding ring featuring 9ct white gold matt centre and 9ct rose gold polished edges. 9ct white & rose gold matt & polish 6mm ring is rated 5.0 out of 5 by 2. Rated 5 out of 5 by Anonymous from Replacement I lost my Wedding ring a few weeks ago , it was Dual tone Titanium , Went to the shop in Southamton and saw this one . I had seen it on line , and I am now wearing it . It looks less Rose in fact , and it is a lovely subtle shade . Very pleased with it . Service was excellent as well . Rated 5 out of 5 by Anonymous from Really nice ring I bought the ring for my hubbie as a replacement wedding band. He wasn't too keen as he wanted something more subtle without the curvy edge. Otherwise he really liked the style and colour mix about it. Looks better in real life compared to the pictures online. Ps: I got the ring as a surprise gift and used the online ring-sizer tool which was totally off (ended up getting quite a few sizes too big). Would not recommend the tool.